I have almost finished a small lap size quilt/wall hanging (haven't decided its use yet) and I want to try free motion quilting for the first time. It is a Japanese type panel with borders. (Can't send picture because my home computer is in the shop) All I have done is stitch in the ditch and cross hatching. I am thinking about using a stencil. Would it be the best approach for the first time? Any suggestions? I would not use a stencil for my first time with FMQ. 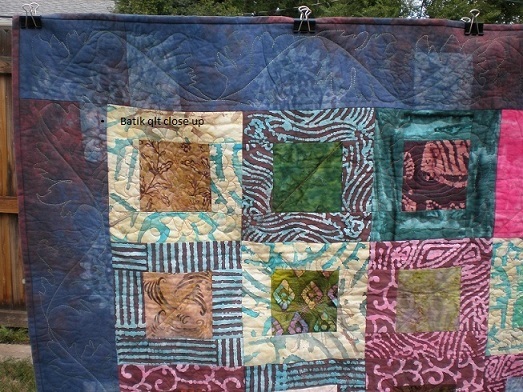 Instead try doing some swirls or leaf patterns without marking your quilt. I think it's much better to get the hang of it before you start trying to follow a set pattern. And above all, relax and have fun. continuous line stencil designs would work once you get the hang of FMQing. make up some squares with batting inside and practice some. you can always use those in a quilt later on if you like your work. here is one I did in the border with a stencil. I marked my vine and leaves. then went around doing FMQ on the leaves and vine, one side all around. then back again on the other side to finish the leaves. Last edited by nativetexan; 06-28-2013 at 09:42 AM.